John Anderson Roberts was my great-grandfather. I never knew him. 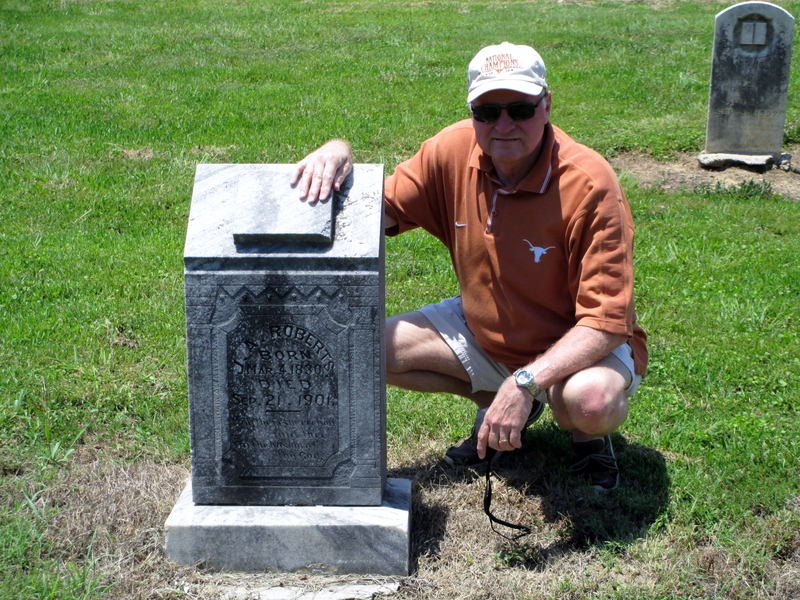 I stood beside his grave on a warm Texas summer day and wondered, would he have done anything differently? I don’t know. Maybe? Probably. After all, he was dead and his much younger wife was accused of murder! His life was over. It remains for me to tell his story. To have an end you need a beginning. John Anderson Roberts arrived at one of America’s early crossroads on March 4, 1830. [i] His parents John Rivers and Rebecca Ann Giles Roberts were among the area’s earliest European settlers. They were born in Virginia and came to middle Tennessee with their parents soon after it was opened for settlement. Williamson County, Tennessee became a well-worn crossroads on the great western movement of America’s European people groups. They came from many points of origin, using ancient trails and modest means, to enter this land once the coveted hunting grounds of Native Americans. The old Natchez Trace ran just to the west of today’s modern county line. Lewis Merriweather would die on the Trace October 11, 1809 at Grinder’s Stand of self-inflicted gunshots. [ii] That’s about 50 miles from John’s future birthplace. The earliest roads would come through this area to link-up with the Trace and connect to shipping points on the Cumberland River to the north in today’s Nashville. The farmers would come in waves to till this land in middle Tennessee so rich in water and other resources. John grew up fishing, hunting and mostly farming along McCrory and later Rutherford Creeks in the southern part of Williamson County. His neighbors were from all over the settled colonies but many of their names can be traced back to Lunenburg, Mecklenburg and Charlotte Counties, Virginia. 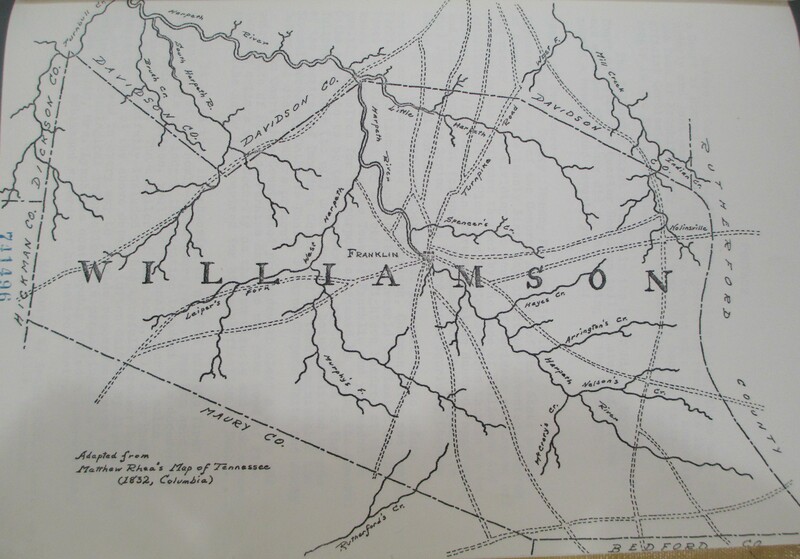 1832 Map of Williamson County, Tennessee. Adaptation from Matthew Rhea’s Map of Tennessee (1832, Columbia. John’s father, John Rivers Roberts, was born about 1800, probably in Lunenburg County, Virginia. He arrived in Williamson County before 1805 with his father John Roberts (that’s right, three John Roberts in a row). John Anderson’s grandfather bought and sold land and land warrants early in Williamson. His farm is said to have been located on the headwaters of McCrory Creek. I envision it as having been near the old road that ran through the Duck River Ridge gap (1832 map[iii]) and into Bedford County. It would have been on the northern side of that famous ridge that for a very short period separated whites from Native Americans. 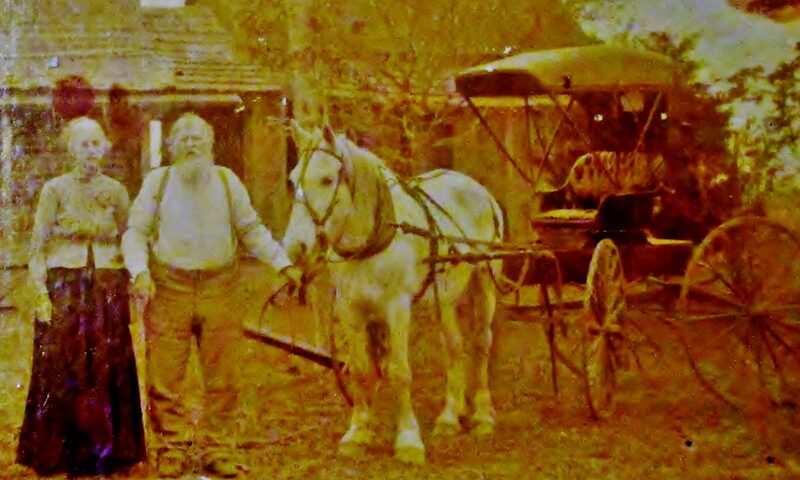 It’s likely John Anderson spent the first years of his life on the McCrory Creek property after his grandfather died in 1823 leaving John Rivers to help his mother Rebecca with the farm. John R. later purchased several properties on Rutherford Creek including at least one with his younger brother Newton. John Rivers Roberts never knew his grandfather. John Anderson Roberts never knew his grandfather. Gus Roberts never knew his grandfather. Burton Lee Roberts never knew his grandfather. Is it possible to miss what you’ve never had? John Anderson Roberts appears as a “tic” in the 1830 Federal Census for Williamson County. He’s born into the John R. Roberts household three months before the census. His siblings include older half-brothers Clement Smithson and James S. Roberts from his father’s first marriage in 1821 to Sarah B. Smithson. She died March 4, 1826, exactly four years prior to the day of John’s birth by his dad’s second wife[iv]. His father remarried in 1827 to my great-great-grandmother Rebecca Ann “Anna” Giles[v] and they produced William Claiborne (1827) and Sarah Ann “Sally” Roberts (1828)[vi]. John Anderson joined them in 1830. Thomas Paschal (1832) and Lucy Jane (1833) Roberts come later. As far as I know this completes the John Rivers’ offspring[vii]. He would, however, live long enough to marry a third wife in Kentucky, Malinda Miller Holland, the widow of his neighbor Josiah Holland. John R. would serve as a stepfather to her son Henry B. Holland. They appear together in the 1880 census for Calloway County, KY. The Roberts’ 1830 neighbors in the south end of Williamson included Nicholas Perkins, Robert Owen, James Elliot, Henry Padget, John Ragsdale, John Blythe, Richard King and Charles Smithson. [viii] Now, here’s an interesting coincidence. The neighbor Perkins in this group of neighbors is Nicholas Tate Perkins. He was the Captain of a mounted riflemen unit out of Wilson County, TN in the War of 1812. 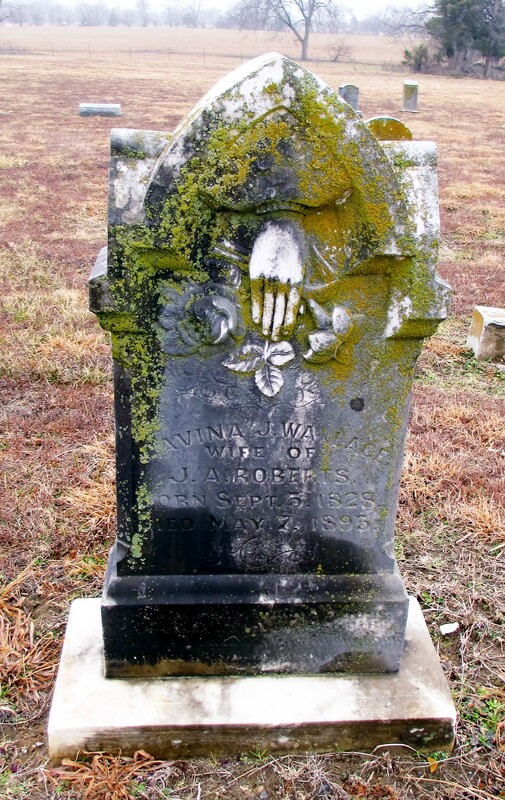 [ix] My 3rd great-grandfather Jeremiah Horn served as a corporeal and his older brother John as a sergeant under Captain Perkins. [x] Their father, Jeremiah Horn Sr., was born in the same part of North Carolina as Perkins. Perkins married in today’s Jefferson County, TN near the time and place of my 3rd great-grandfather Horn’s birth. [xi] The Horns I mention in this aside to my John Anderson Roberts’ story are from the Byrd side of my family tree. The exact opposite side to my Roberts’. B.L. Roberts and Bertha Mae Byrd met and married in the Hill Country of Texas over 120 years later and from this union, I would be born. Crazy coincidence? I think so. J.A. Roberts reported the following on the “ag schedule” for the 1850 census in the 13th District. This would be the McCrory Creek farm and indicates twenty-year-old John is responsible for its oversite. Now begins their difficult journey toward my future and the tragic end to the life of John Anderson Roberts. [i][i] Sources: 1830, 1840, 1850 Williamson County, TN Federal Census; Headstone. [ii] The fact that Merriweather died here is not in dispute. How he died is still being debated. [iv] From scans of the Smithson family bible found by author in the Pogue Library in Murray, KY February 2013. [v] Source: Multiple marriage records from Williamson County and copies of microfilm images in my possession. [xii] 1840 Federal Census for Williamson County, TN. I mention Joseph Anderson because of his proximity to the Roberts and the middle name of John. [xiii] 1850 Federal Census for Williamson County, TN and a fun poke at my Smithson and Giles cousins. Previous PostPrevious When does the common become uncommon?